Fadlallah died Sunday in a hospital in Beirut, Lebanon. My tweet was short: "Sad to hear of the passing of Sayyed Mohammad Hussein Fadlallah.. One of Hezbollah's giants I respect a lot. #Lebanon"
Reaction to my tweet was immediate, overwhelming and a provides a good lesson on why 140 characters should not be used to comment on controversial or sensitive issues, especially those dealing with the Middle East. It was an error of judgment for me to write such a simplistic comment and I'm sorry because it conveyed that I supported Fadlallah's life's work. That's not the case at all. I met Fadlallah in 1990. He was willing to take the risk of meeting with a young Christian journalist from the Lebanese Broadcasting Corporation. Fadlallah was at the height of his power. As I was ushered in, I was told that he would not look at me in the eye and to make it quick as there was a long line of dignitaries waiting. The interview went 45 minutes, during which I asked him about Hezbollah's agenda for an Islamic state in Lebanon. He bluntly told me that was his group's dream but there would be room for other religions. He also joked at the end of the interview that the solution for Lebanon's civil war was to send "all political leaders without exception on a ship away from Lebanon with no option to return." He challenged me to run the entire interview on LBC without editing. We did. This does not mean I respected him for what else he did or said. Far from it. It is no secret that Sayyed Mohammad Hussein Fadlallah hated with a vengeance the United States government and Israel. He regularly praised the terror attacks that killed Israeli citizens. And as recently as 2008, he said the numbers of Jews killed in the Holocaust were wildly inflated. But it was his commitment to Hezbollah's original mission - resisting Israel's occupation of Lebanon - that made him popular and respected among many Lebanese, not just people of his own sect. In 1983, as Fadlallah found his voice as a spiritual leader, Islamic Jihad - soon to morph into Hezbollah - bombed the U.S. Marine barracks in Beirut, killing 299 American and French peacekeepers. I lost family members in that terror attack. And it was during his time as spiritual leader that so many Westerners were kidnapped and held hostage in Lebanon. In later years, Hezbollah's leadership apparently did not like Fadlallah's vocal criticism of Hezbollah's allegiance to Iran. Nor did they like his assertions that Hezbollah's leaders had been distracted from resistance to Israeli occupation of portions of Lebanon and had turned weapons against their own people. At first, he was simply pushed to the side, but later wasn't even referred to as a Hezbollah member. Rather, he was referred to as the scholar - the expert on Islam - but nothing more. 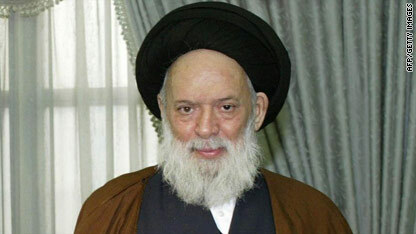 During the 2006 war between Hezbollah and Israel, his honorary title "Sayyed" - indicating that he's a descendant of the prophet - was dropped any time he was mentioned on Hezbollah's Al-Manar TV and other Hezbollah media outlets. Through his outspoken Friday sermons and his regularly updated website, Fadlallah had a platform to spread what many considered a more moderate voice of Shia Islam than what was coming out of Iran. Immensely popular in Lebanon among the various religious groups, he also had followers across the region including in Saudi Arabia, the UAE, Kuwait, Bahrain and even as far as Morocco in northern Africa. in the dark ages. What makes a modern and educated woman to adore these type of clerics? Nasr is a victim of censorship. David Weigel was fired by the Washington Post for expressing scorn for the likes of Rush Limbaugh . Eason Jordon was fired by CNN for publically expressing concern about the U.S. military’s appalling habit of shooting at journalists not officially "embedded." Back in 2003 NBC fired Peter Arnett for remarks on Iraqi TV raising doubts about Bush Jr’s invasion of that country. The right had accused him of treason. MSNBC fired Ashleigh Banfield for suggesting that the American media were all becoming mimics of Fox TV. Even Phil Donahue got axed because he was perceived as being critical of President Bush Jr.’s war. CNN has become a propaganda tool. It's shameful...the betrayal of trust displayed by CNN. This isn't journalism. No wonder so many people turn to Jon Stewart for "news." Octavia Nasr wrote something positive about this man. She apologises for the error of judgement she made in sending her comment out in 140 characters. I admire her for the comment and the error of judgement as she describes it. The problem with the world we live in at present is that we take those with opposing views and attempt to demonise them. This serves no other purpose than to breed resentment, perpetuate misunderstanding and encourages continued and worsening strife. It is far easier to encourage people to fight the demons we create and paint than it would be if we were to paint a more rounded picture of people and their views. Shouldn't her comments merely have started a debate rather than lead to her sacking? I expect there will be more truth in the numerous comments to this article that we ever get from traditional media anyway. This is CNN, this is our view, you make sure you uphold that view or we will terminate your employment. And what is that view? Where does it come from? Why can't we challenge it? This my friends is why traditional media will soon lose its voice and why it deserves to. Nasr, due to regret what you have written you become loose and you lost our respect,you must keep it because you are not starter in CNN. CNN does not support 140 characters of his professional staff. U.S. wants to export democracy to other countries by force. Really it's like to export AIDS.The viruses USA-Zionism is worse than HIV. Hire her back. Journalism needs people with knowledge and the willingness to post more than the status quo. I had been a supporter of Israel for the past 30 years, but have recently had a change ot heart and mind following the murderous assault on Gaza in December 2008 and the recent attack on the aid flotilla. I now see Zionism as a continuation of the genocide which the Jews used against the Canaanites 3000 years ago. Does 'God told me to do it' justify genocide??? I don't think so. I salute the brave people who have given their careers and lives to resist the Israeli assault on the Palestinian people - Helen Thomas, Octavia Nasr, Rachel Corrie and the nine aide workers killed in May. May their sacrifices give the rest of us courage to do likewise. Just found out about the departure/firing of Ms Nasr after returning from vacation. CNN's future coverage of the Middle East will be the less for it. Could there not have been a more measured response for her error in judgement? not all muslims are terroriists... But all terrorists are Muslims Extremists. Way to go, CNN. You've destroyed the last thinning shred of credibility you had. I'm dropping you from my cable package, and purging you from my RSS feeds. You're an embarrassment to the world of journalism. There is some serious hoo ha that Yelp is making through their review service which basically provides a weapons platform for ungratified customers to give negative reviews about businesses . It is really disheartening because 95 % of customers are usually more than happy with businesses and their services. If you have bad reviews out there then you might want to look into a reputation defender and reputation management service like review buster. They seem to be a relatively new service, but they are making an interesting buzz on the net ... and taking a look at their site it's kinda laughable. anyways i think online reputation is a really important thing so take a look at it. chanel handbags for sale is just about the solutions that a majority of girls need to individual on the globe. Your developer Chanel luggage also have a lot of high-profile stars while spokes types. Men and women enjoy for the reason that in the glamour in the company, certainly not the retail price. However the majority of women and men don't let yourself be acquainted with coach electric outlet shop frequently maintain designs and styles which are in no way handed through the coach Purse shops from primary area stores, or even on the internet. If you're considering impressive the actual coach Purse electric outlet to select the greatest agreement upon purses, help to make good you're alert to the next information. Within our incredible material associated with coach purses, they're offered along with people from moderate cost. Preserve within the center how the handbag compared to not really you'll have people marketing the actual affordable totes to complete help to make certain that it's sunburned or even not really. Additionally probably the most palpable element to consider the knockoff when you are able happen to be sewn collectively ¨C not really smallest check to determine the actual faultless sundown tote detailed at any given time in support of stop once they won't ever upset. However are you aware exactly where where to get discounted prices is actually? For me, coach electric outlet shop on-line may be one of the great choice. Make sure that a person change stop this. Knockoffs mainly used bad sentence structure as well as phrases which are through getting sued with regard to promoting reproduction types the actual thump offs may have the ¡°G¡± onto it. 7. Much more upon sturdiness: they're each drinking water evidence as well as fireplace evidence. This particular originates from the actual mixture of supplies which are accustomed to produce all of them - canvas with regard to waterproofing as well as PVC with regard to fireproofing. That isn't an excellent you will find in several products, not to mention wallets. There are many advantages when you buy the lv shoes online – The advantages are that first of all you get it at a much reasonable rate – it is affordable. too short for newbies. May just you please prolong them a bit from subsequent time?